A man who was punched and then hit head his on the ground died due to "blunt force trauma", police have said. A post-mortem examination was carried out on the 48-year-old's body after he died in hospital following an "altercation" in Reading on Friday. 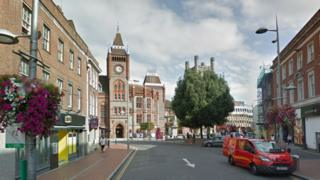 He was injured in a dispute between two men in Friar Street at about 23:30 BST. The dead man has not been formally identified. Thames Valley Police is carrying out a manslaughter investigation. An 18-year-old man, from Crowthorne, was arrested in connection with the incident and has been bailed until 10 May. The teenager was initially arrested on suspicion of murder.